Well I think it's safe to say autumn has well and truly arrived this week! 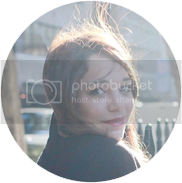 Frosty mornings, Starbucks red cups and lots of woolly knits - curled up editing these photos with my M&S Winter candles burning happily on the window sill, it's hard to suppress my burgeoning excitement for you-know-what (clue - it starts with C and ends with Hristmas!). 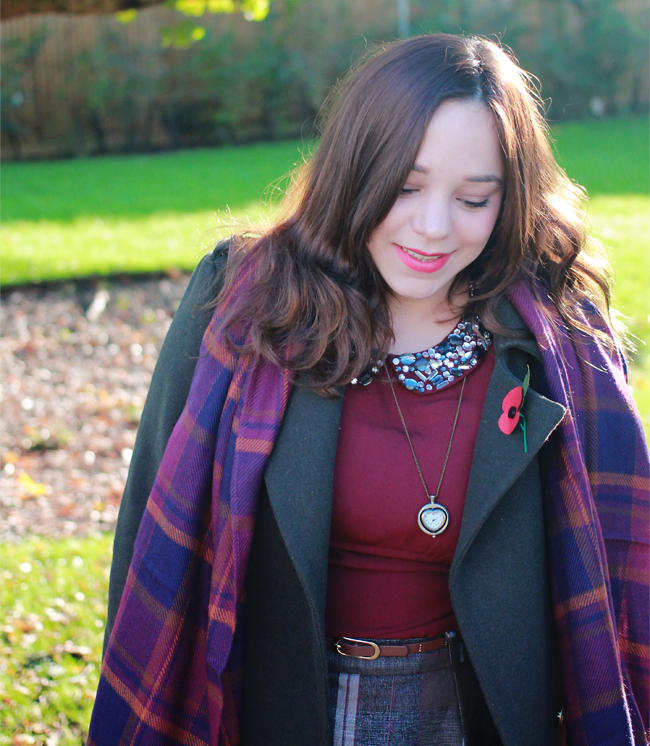 Cold weather always seems to beckon my preppy side and thankfully the high street is complying with my urge to look like a 12-year-old with an abundance of tartan, plaid and whimsical jewellery! Admittedly most of my outfit is made up of pieces I already own, partly because I'm practically penniless and also because I now own enough clothing to wear a different outfit every day (a fact made painfully obvious to me some time ago when a colleague asked if I ever wore an outfit twice - it's time to admit I have a problem...). In fact, the only new purchase is the scarf - I don't often buy from Boohoo but I was on the hunt for a nice tartan scarf in warm colours and could only find red and blue ones in shops! This was only a tenner and it's lovely and warm, it's also fairly big so perfect for those chilly mornings. 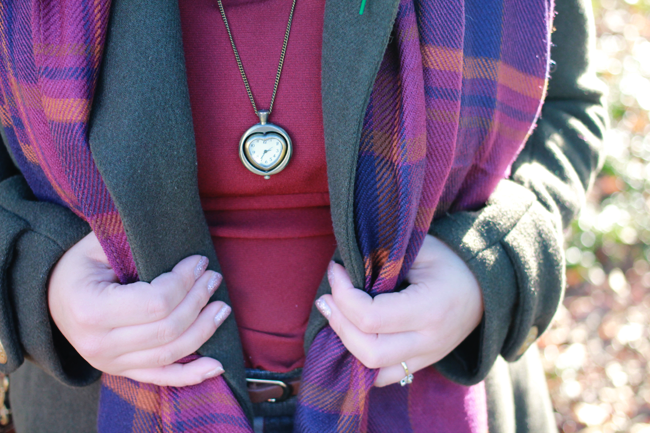 I quite like the contrast of the purple and muted mustard shades against my green coat. The rest of the outfit has all appeared on the blog in some guise before - I've actually managed to track all the previous posts down, thus proving the usefulness of my blog as an outfit archive. 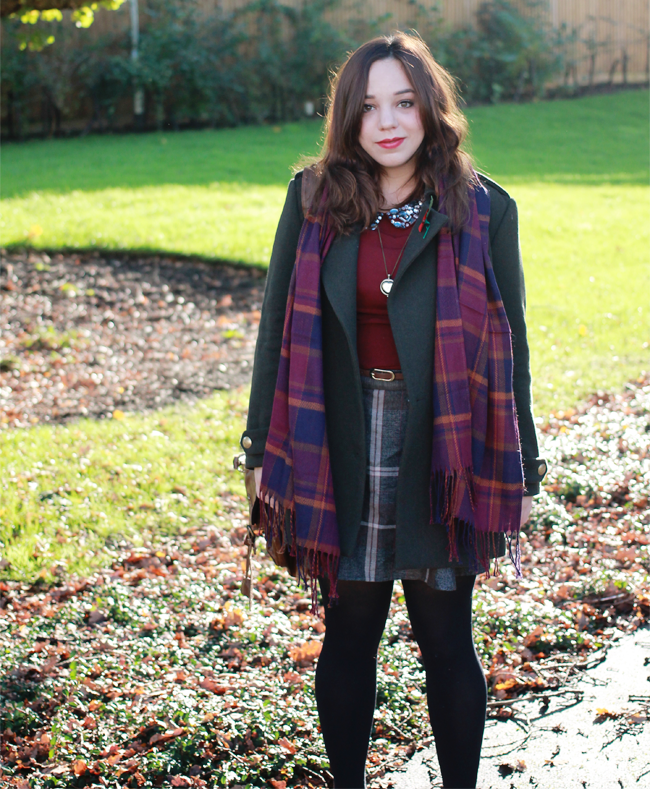 The coat and top (dress) are both H&M sale finds, the skirt is ASOS (purchased after seeing it on fellow blogger Maria, no less!) and the necklace was a gift during my uni days, after dropping so many hints I ended up receiving it from two people. Oops. 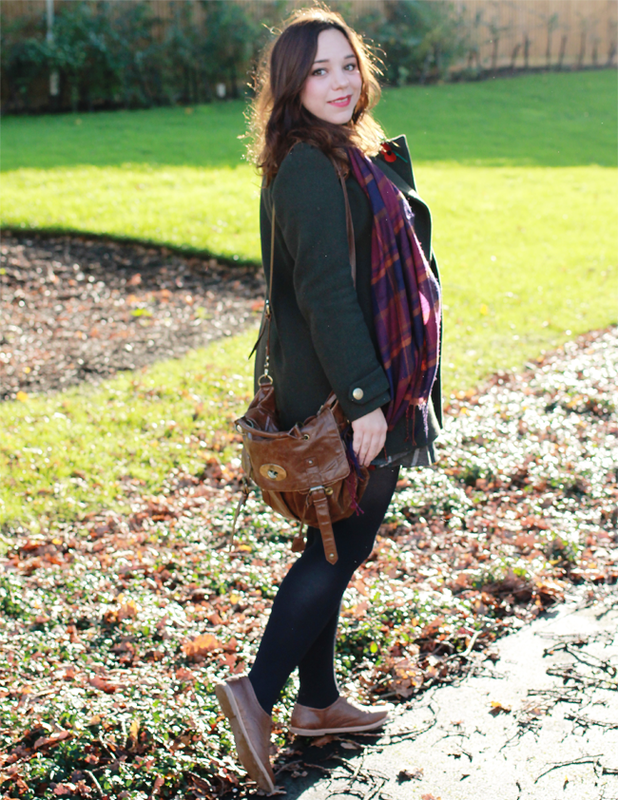 The satchel is an old, old favourite, practically falling apart at the seams, but I love it too much to let it go. Story of my life! Now it's back to work rather than the school the outfit seems to suggest, but I feel curiously motivated now I have gingerbread lattes to see me through the haze of a Monday morning! Hope you all have a good week! Love the colour scheme in this outfit!